Who were Catholicism's greatest orators? What was the key to their effectiveness? Was it mere scholastic ability or spiritual inspiration? The answer is "both." 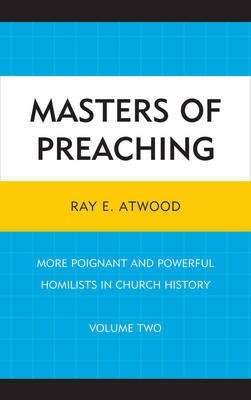 In this follow-up work, Father Ray E. Atwood examines the lives, theologies, and preaching examples of the Church's greatest preachers. This book tells the story, in biographical form, of Catholic preaching from the Old Testament through today, concluding with the homilies of Benedict XVI. Masters of Preaching takes the reader around the world in search of homiletic gems. Readers will learn about the stories of familiar figures, such as Saint Gregory the Great, and less familiar figures, such as Monsignor Francis Friedl. Readers will also discover how these men moved their congregations to deeper faith and greater understanding of the mysteries of salvation. Two appendices at the end of the book serve as a terrific resource for those looking for practical illustrations of lectionary themes. This book is an excellent resource for anyone interested in the subjects of public speaking and Church history.